Joseph Kwahu Duah Addai Jr. (/æˈdaɪ/ ad-EYE) (born May 3, 1983) is a former American football running back in the National Football League (NFL). He was selected in the first round (30th overall pick) of the 2006 NFL Draft out of Louisiana State University by the Indianapolis Colts and played for the team for six seasons. He won Super Bowl XLI with the Colts, defeating the Chicago Bears. Addai's family hails from Ghana in West Africa. He has twin sisters named Juby and Rune. In high school, Addai was a left-handed option-style quarterback for the Sharpstown Apollos. He played football and ran track. In his senior year, he rushed for 1,429 yards on 159 carries and completed 37 passes for 425 yards. He was chosen as a member of the 5A All-State first team in Texas. He was named an All-American by ESPN and Fox Sports, and was rated as a top 100 recruit. In track, he was timed at 10.7 seconds in the 100-meter dash and at 22.1 seconds in the 200-meter dash. During his tenure with the Louisiana State University Tigers, he ranked fifth all-time in rushing, with 2,577 yards, despite being primarily used as a blocking fullback early in his career. He wore two numbers while at LSU, 41 in his early years and then number 10 in his final years. Addai started his stint at LSU in 2001, but after only two games was granted a medical redshirt. The following season, he carried the football 80 times, gaining 438 yards, and scoring four touchdowns. His first big game came against the University of South Carolina, during which he gained 98 yards on eleven carries and scored two touchdowns. On November 9, 2002, he amassed 91 yards, including a 63-yard run for a score, against the Kentucky Wildcats at Commonwealth Stadium. His performance helped to set the stage for The Bluegrass Miracle, a "miraculous" 74-yard game-winning touchdown pass from quarterback Marcus Randall to wide receiver Devery Henderson as time expired on the last play of the game. Addai's sophomore season proved to be a banner year for LSU. Led by coach Nick Saban, the Tigers won the BCS National Championship, the first national championship for LSU since 1958. Addai ranked second to freshman Justin Vincent in rushing, gaining 520 yards on 114 attempts. He led LSU's early season 59-13 rout of the Arizona Wildcats with an 86-yard, two touchdown performance. In 2004, he rushed for 680 yards on 101 carries and caught 24 passes for 294 yards, scoring a total of seven touchdowns. He stood out against the Alabama Crimson Tide in a 26-10 Tiger Stadium victory on November 13. He led the team in rushing with 99 yards and added another 46 yards receiving, as well as scoring two of the three Tiger touchdowns. for the day. The following week, he teamed with Alley Broussard (250 yards on 26 carries) to lead the Tigers to a 27-24 victory over the Ole Miss Rebels. Addai's 107 yards was part of an impressive 360 yard ground attack by the Tigers. During his senior season, Addai led the team with 911 rushing yards on 187 carries, scoring nine touchdowns. The highlight of the regular season was a 21-17 victory over the Florida Gators in front of a record-setting 92,402 crowd. Addai sealed the victory for LSU with a three-yard touchdown run with 6:27 remaining on the clock. His career-best effort combined 156 yards rushing on 32 carries with 37 yards receiving on 3 catches. On October 22, 2005, in competition against Auburn, Addai ran for 105 yards as the Tigers ended Auburn's winning streak that year by a score of 20-17. A crowd of 92,664 watched in Tiger Stadium. Addai completed his tenure at LSU with a game in the Chick-fil-A Peach Bowl. In the Tigers' 40-3 victory over the Miami Hurricanes, he gained a total of 135 yards and two touchdowns. Addai also ran track at LSU, where he posted personal bests of 10.70 seconds in the 100 meters and 22.10 seconds in the 200 meters. He graduated from LSU in December 2005 with a degree in general studies and a minor in economics. Addai was selected in the first round (30th overall) of the 2006 NFL Draft by the Indianapolis Colts. Addai was the third running back selected by the Colts in the first round since 1994, when they selected Marshall Faulk with the second overall pick in 1994 and Edgerrin James fourth overall in 1999. Joseph Addai with the Colts on August 26, 2010. On November 26, 2006, Addai tied a Colts franchise record for most rushing touchdowns in a game held by Lenny Moore, Lydell Mitchell and Eric Dickerson, as well as the NFL rookie record by rushing for 4 touchdowns against the Philadelphia Eagles. He was named the NFLs "Offensive Rookie of the Month" for November on December 7, 2006. During the 2006 season, Addai led all rookie running backs in rushing yards with 1,081. He also became the first NFL running back to exceed 1,000 rushing yards without starting a regular-season game. His first career start came on January 6, 2007, for the Colts/Chiefs wildcard playoff game. During the game, he ran for 122 yards and a touchdown on 25 carries and caught seven passes for 26 yards. For the next week, leading up to the divisional round of the playoffs, Addai became the target of Baltimore Ravens' linebackers Ray Lewis' and Bart Scott's trash talking, but did not respond to either of their comments, as the Colts upset the favored Ravens 15-6. On January 21, 2007, in the AFC Championship Game against the New England Patriots, Addai scored the game-winning touchdown with 1:00 remaining, giving the Colts a victory and a trip to Super Bowl XLI. The Colts went on to win the game with their rush attack. Addai had 77 rushing yards and 10 receptions for 66 yards, for 143 total yards. His 10 receptions were the most ever by a running back in a Super Bowl, which left him one catch short of the overall record. On November 4, 2007, in a Week 9 game against the New England Patriots, Addai became the first Indianapolis Colt ever to gain 100 yards receiving and 100 yards rushing in one game. Joseph was rewarded for his play in the 2007 season by being invited to his first and only Pro Bowl in January 2008. On November 1, 2009, in a game against the San Francisco 49ers, Addai completed his first professional pass, a touchdown to Reggie Wayne. 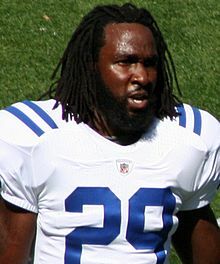 Addai became an unrestricted free agent after the 2010 season and was re-signed by the Indianapolis Colts on July 31, 2011. Addai had his worst season statistically in 2011 as he rushed for 433 yards and only one touchdown. He was released following the 2011 season on March 9, 2012. On May 6, 2012, Addai agreed to a one-year contract with the New England Patriots. On July 24, he failed his physical at the start of training camp for the 2012 season. Addai was released by the Patriots on July 25, 2012. ^ "Addai on Pro-Football-Reference". rbref.com. Retrieved December 21, 2007. ^ Mihoces, Gary (January 9, 2007). "Playoff notebook: Seahawks have own QB concerns; Ravens target Addai". USA Today. Retrieved January 26, 2007. ^ "Source: Pats, Joseph Addai agree". ESPN. ^ "Patriots sign DL Tim Bulman and TE Visanthe Shiancoe; Release RB Joseph Addai". patriots.com. Wikimedia Commons has media related to Joseph Addai.